150 new creatures for The Strange from the exotic recursions lying in Earth’s shoals. Featuring more than 150 creatures and characters, The Strange Bestiary is lavishly illustrated and wildly imaginative. Find creatures encountered on Earth along with those native to the recursions of Ardeyn, Ruk, Crow Hollow, Atom Nocturne, and others. Plus scores of creatures that fit any recursion operating under the Laws of Magic or Mad Science, or from worlds seeded by Earthly fictional leakage. Monument spiders, data sentinels, octopus sapiens, extereons, blobs, kaiju, and killer robots are just the beginning for the diverse and incredibly creative settings of The Strange! 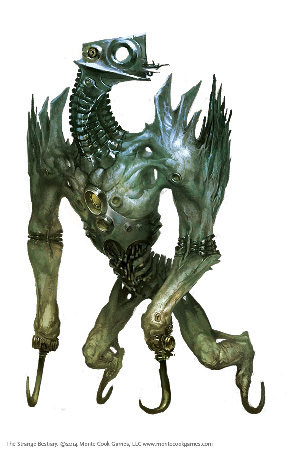 Numenera players will find these creatures completely compatible with their campaigns. There are conversion notes and alternate Ninth-World-specific background descriptions for scores of these creatures in our FREE glimmer, Strange Creatures of the Ninth World. If you like saving time and hassle, you might also be interested in the The Strange Creature Deck. It gives you 99 of the most commonly encountered creatures in the shoals of Earth, drawn from both The Strange corebook and The Strange Bestiary. Build your encounters quickly and easily, or create them randomly on the fly—simply draw a card from the deck! 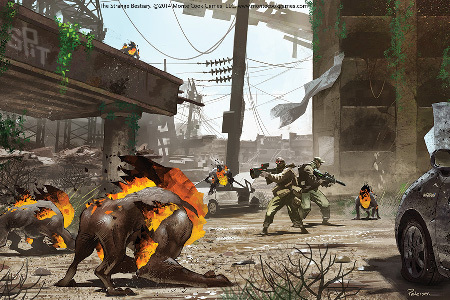 The Strange Bestiary has a number of handy features that make it a pleasure to use at the gaming table. This short video gives you a tour of a few of them!